It gives me great pleasure to share with you the work and impact the Foundation has made during the third and fourth quarter of 2018. 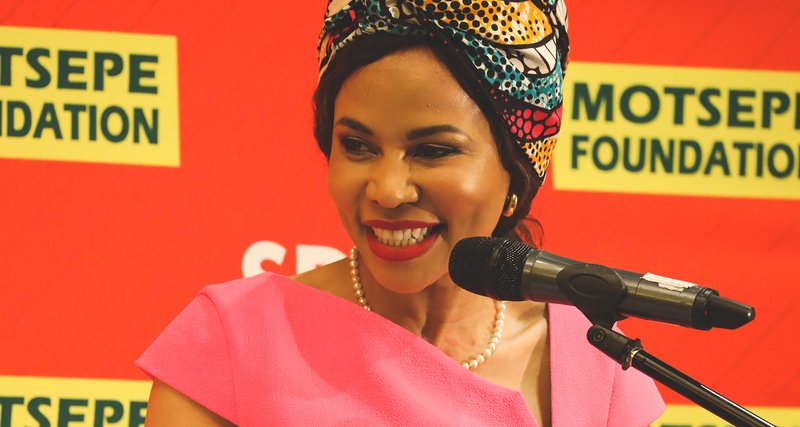 The Motsepe Foundation’s founding vision is to improve the quality of life for all, by promoting respect for diversity and supporting projects that have the potential to assist beneficiaries in becoming self-reliant. This correlates to the UN’s Sustainable Development Goals (SDGs), to end poverty and ensure peace and prosperity. The Foundation, through SDG 17 – partnerships for the goals, has made progress in the two quarters by connecting directly with other organisations and communities to maximise impact. As South Africa prepares for the Fourth Industrial Revolution, the Foundation aims to equip learners with the necessary skills. In order for automation to be a true revolution, the benefits must be reaped by the majority, inclusive of women, the working-class and the disabled. Our Girls in STEM programme encouraged 750 high school girl learners from 34 anchor schools in Gauteng, North West, Mpumalanga and Free State to pursue careers of the future. Young girls in South Africa are passionate about making a difference in their communities and aspire for leadership in all capacities. I believe that our role is to nurture their dreams and create environments that make it possible to succeed. The Women’s Unit also hosted a SDG 5 Breakfast, which included two panel discussions on urgently addressing gender equality in our lifetime. The Breakfast brought together inspiring leaders, including Dr Nkosazana Dlamini-Zuma, Amina Mohammed, Gracą Machel and Thuli Madonsela. The conversation introduced issues surrounding girls and women, and identified a need for accurate data that reflects health, employment, poverty and ICT innovation challenges relating to women empowerment. The Bursary Unit successfully allocated 220 bursaries, of which 119 (54%) were allocated to female students and 101 (46%) to male students. We were pleased to hear the government announcement of free higher education for disadvantaged students last year, and the Bursary Unit fully supports this initiative. Our newly established Alumni programme grew by 86 graduates this year. Half of these graduates are now pursuing post-graduate studies. It is wonderful to observe the growth of our bursary recipients. Through the Almuni programme, we aim to assist our graduates with further support by analysing their unique experiences in the labour market. I am also proud to witness the Foundation’s values of Ubuntu being passed down. We hosted an event to honour the graduates of 2018, and many of them expressed their willingness to assist new bursary recipients with career guidance, tutoring and networking. In the last six months, R24 million was donated to 165 beneficiaries, namely schools and churches, for infrastructure. The Roadshows’ on-the-ground engagement is vital to achieving our goal of building self-sustaining communities. The people we aim to assist must play a vital role in decision-making and planning as the programmes affect their lives most. The 2018 Kay Motsepe Schools Cup was a success, with 5002 schools participating in the Football Cup and 6020 in the Netball Cup. The winning schools in the Football Cup won funding to develop or improve their sporting grounds and other facilities, while two winning schools from the Netball Cup were sponsored to partake in an international Netball competition in Singapore. Our annual National Day of Prayer was attended by over 140,000 people. The 34 religious and faith-based organisations who participated represented all the cultures and traditions in South Africa, and instilled a united vision for a prosperous future. Christmas with our people is another annual initiative that celebrates the successes of the year with our partnering communities. Approximately 200,000 children received toys, which were distributed across the country. The Foundation is dedicated to sharing the joy of the festive season with our anchor schools, spreading the cheer to children who come from low-income households. Being involved in the 16th annual Nelson Mandela Lecture, celebrating his centenary, was an honour. The lecture brought former US President Barack Obama, who delivered the keynote address, and encouraged Madiba’s legacy amongst the youth of today. Following this centenary celebration was the highly anticipated Mandela 100: Global Citizen Festival. Commitments totalling $7 billion were made by the private sector, social organisations and governments. The Foundation, with related companies, committed $350 million until 2030 to advance education, economic inclusion for women and girls, and land reform. Over 5 million acts were taken by the youth to attend the concert, and the message of individual responsibility for the Global Goals inspired the worldwide audience. This year provided an outline for the Foundation’s initiatives in 2019. The pioneering voice of the youth and the unity 2018 inspired will allow for greater strategic commitments in the future. I would like to extend my gratitude and well wishes to all our trustees, staff, and stakeholders for their dedication and ongoing assistance. Your active support has allowed the Motsepe Foundation to continue working toward making a positive impact and transforming the lives of South African people.